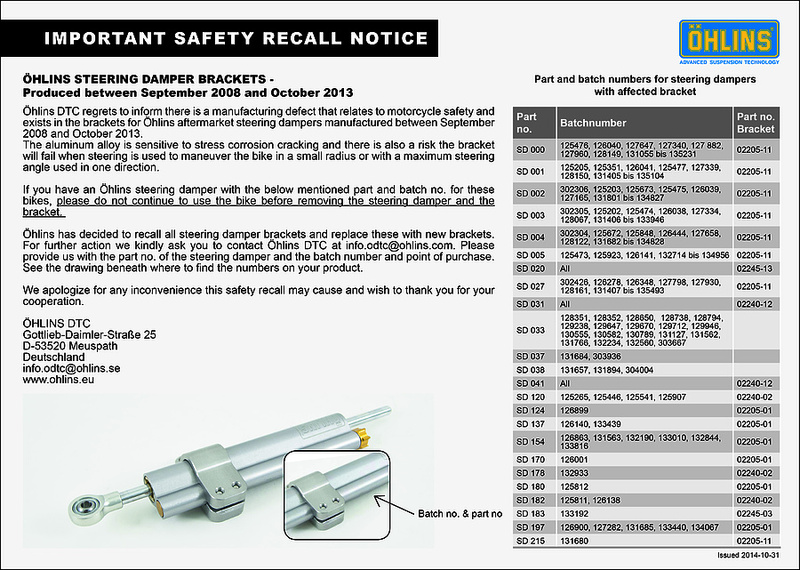 Öhlins DTC regrets to inform there is a manufacturing defect that relates to motorcycle safety and exists in the brackets for Öhlins aftermarket steering dampers manufactured between September 2008 and October 2013. The aluminum alloy is sensitive to stress corrosion cracking and there is also a risk the bracket will fail when steering is used to maneuver the bike in a small radius or with a maximum steering angle used in one direction. If you have an Öhlins steering damper with the below mentioned part and batch no. for these bikes, please do not continue to use the bike before removing the steering damper and the bracket. Öhlins has decided to recall all steering damper brackets and replace these with new brackets. For further action we kindly ask you to contact Öhlins DTC at info.odtc@ohlins.se. Please provide us with the part no. of the steering damper and the batch number and point of purchase. We apologize for any inconvenience this safety recall may cause and wish to thank you for your cooperation. The part and batch no. you will find in the download.